In the summer of 1997, before Graham did his oven mashing work in the autumn, I'd been doing some hearth mashing experiments in the back garden. 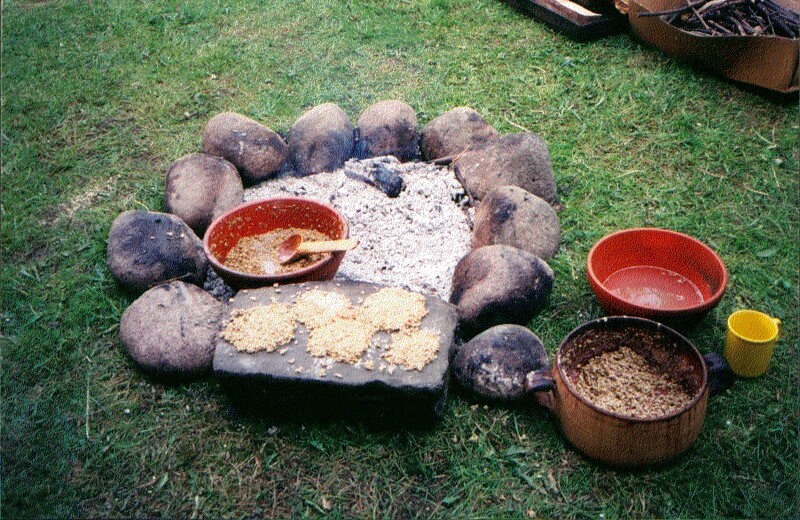 I wanted to see whether I could make malt sugars using basic equipment and facilities, something similar to that used by people in the neolithic era: an open fire and pots. I did some baking on a stone beside the fire as well. I used pale crushed malt from Fawcett's. It was simple, straightforward stuff. Graham was dubious that it would work. He reckoned it might not be easy to meet the narrow specific temperature band, between 62 and 70 degrees Centigrade for the successful enzymatic reduction for the saccharification. But I thought I'd have a go anyway. Replica neolithic pots were not easily available then. However the local garden centre had some suitable unglazed earthenware pots, so we bought and used them. The bowls were porous and, given they were to be used for liquids, they had to be sealed. We sealed some with beeswax, others with lard or butter. But this is another story - fats in prehistoric pots and what they might or might not represent. It's complicated. Using stones from the garden, I made a small hearth and lit a fire. I went for the classic camp fire style, a round hearth. 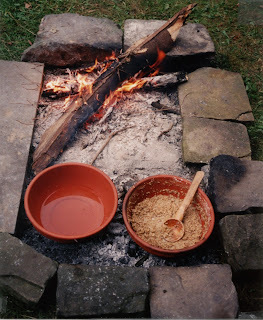 In one of the bowls I mixed some crushed malt with cold water, as below, and started to heat it in the hot embers. I had some cold water ready to cool it down, should it become too hot. After about half an hour, the mixture was beginning to smell like one of Graham's mashes. There was that familiar sweet, delicious, malty aroma. The mash slowly began to change colour, becoming darker brown. It tasted sweet. Although the conversion from starch into sugars was working, albeit slowly and not very efficiently, I found it difficult to control the temperature in such a small hearth. The embers were cooling too quickly. The mash was getting cold. The hearth was far too small to be a working hearth. I never needed to use that cold water. I tried adding wood to the fire. This didn't work. The wood produced flames but not sufficient radiant heat. I moved a hot stone next to the pot, that didn't work either. Quite clearly, a lot more practice using an open fire was required. I needed a bigger hearth. More of that later. By now the large flat stone was hot to the touch. So I decided to use it for a kind of baking or mashing experiment. I had no idea what would happen. I'd never done anything like this before. making malt flat breads or sweet bappir - what should we call them? Crushed malt was mixed with cold water to make a thicker mixture than I had made for the bowl mash. A few little 'cakes' or 'biscuits' were gently warmed up on the hot flat stone. It was not a fierce heat. Provided that we kept splashing them with water, they too began to turn a nice golden brown colour. Water is necessary for the enzymatic reduction, both as a physical transport and as a chemical component in the hydrolysis. After about half an hour, the malted barley biscuits began to taste sweet. This is a simple demonstration that sugars can be made from malted grain with no need for a container. I'm not sure what to call them; they are not like modern cakes or biscuits. Perhaps the best description is the Sumerian word bappir, which seems to have been a kind of beer bread. There was no honey, dates or yeast in my bappir. The only ingredients were crushed malt and water. All of the malty sweetness came from the malted barley, by the process of the enzymatic reduction of starch into malt sugars. I mentioned earlier that I needed a bigger hearth. So I built one, based upon the large rectangular hearths that we had seen at the neolithic village of Skara Brae, Orkney. It was so much easier to use than the small round hearth. I could have a fire running at one end, then rake the hot embers to surround the bowl that I was mashing in. The temperature of the mash was a lot easier to sustain for the necessary hour or so for the conversion from starch to malt sugars. I could see, smell and taste the saccharification in my mini mash tun. Today experimental archaeologists talk about the experiential and the experimental aspects of what they do and what they try to re-create. In this simple hearth mashing experiment I was experiencing the aromas, the taste and the effectiveness of this simple technique. I successfully made malt sugars from malted grain and hope that there is enough information for this fundamental experiment to be repeated by others. If not, then please get in touch and ask me about it. 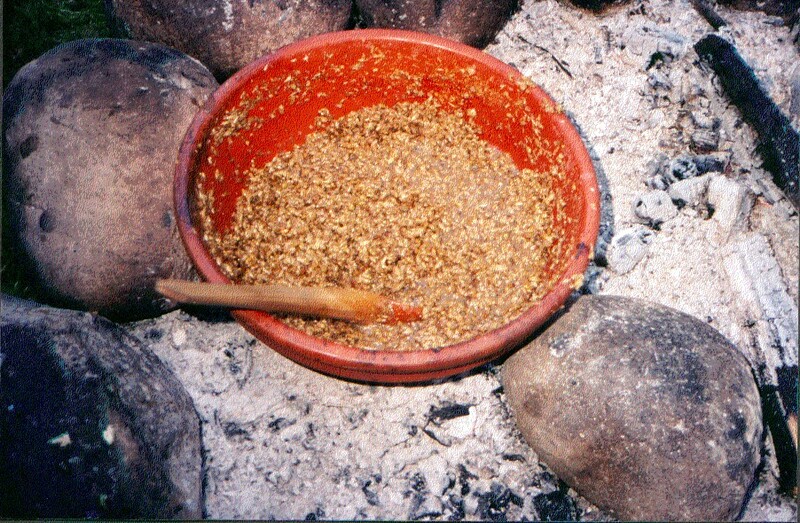 These simple hearth mashes and making sweet bappir from crushed malted barley and water formed a part of my M.Phil thesis 'Barley Malt and Ale in the Neolithic' which was completed in 1999 and published (by invitation) as a BAR in 2004. The experiments were repeated several times. Every time the crushed malt and water became sweet and the saccharification worked. Eventually, what had started as an experiment in my back garden became a demonstration. 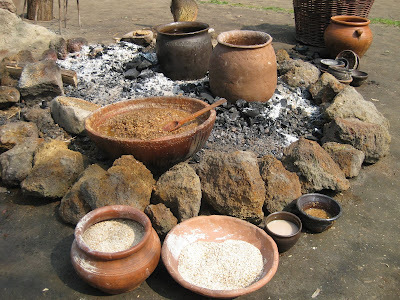 In the spring of 2009 I was invited by EXARC to the Eindhoven Open Air Museum to take part in a beer brewing workshop. I arrived with nothing. I had no malt and no pots. I wasn't sure what I was going to do. Thankfully, the medieval brewers had plenty of crushed malted barley for their demonstration and they were happy to give me some. The museum potter, Flor Buchuk Gil, had some fine pots and she was happy for me to choose and use one of hers. For the mashing in demonstration I selected a beautifully made wide earthenware bowl that had been burnished to make it watertight. The hearth was large and round, so there was plenty of space to burn wood and use the hot embers from that to heat the bowl mash. The conversion was excellent. The initial saccharification occurred within the first hour of mashing. I was busy talking to visitors, explaining the process and what was happening. In that time I neglected to stir the mash. It became caramelised and ended up being incredibly tasty and sweet. Some small flat stones were found. They were used to make some sweet bappir, as I had done in the back garden. Once again, the saccharification worked very well indeed. Visitors tasted the mash from the bowl and declared it to be delicious. I noticed that, at the end of the day, most of the sweet bappir or malt flatbreads had been eaten. Pale crushed malt, a bowl mash and most of the sweet bappir have been eaten. Making malt sugars from crushed malt requires water, but it does not require a container for that water. 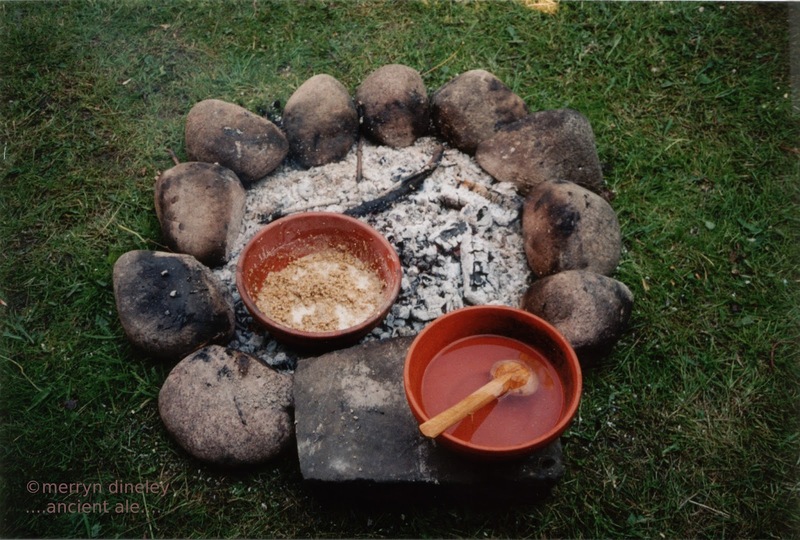 Malt flat-breads (aka sweet bappir) can be made on a hot stone beside a fire with nothing other than malt, stone, water and fire. This technology, or alchemy, was available to the first seed gatherers of the ancient Near East. All they needed was the knowledge and experience of malting the gathered cereal grains. Professor Li Liu and her team at Stanford University have recently identified morphological changes in starch granules that are consistent with malting. These date from 13,000 years ago. See here for more details. This technology could be many tens of thousands of years old, beginning with the first seed gatherers. These malt flat-breads are so attractive and tasty that people eat them. They would have been more attractive than un-malted flat-breads. Once this trick with cereal grains was discovered it would not be lost. Today we probably eat some malt every day. It's added to breakfast cereals and confectionery to make them more attractive. When I stumbled across Boak and Bailey's blog about Pollards : Only a northern brewer it took me down memory lane to when I first started brewing with all grain. It was Autumn 1982. I had just bought a house in Withington, South Manchester. I could do what I liked, without disturbing or disturbance from shared accommodation house-mates. I had got a second hand Baby Burco boiler, formerly used for nappies, and plastic buckets and 20 litre snap lid containers. My first Baby Burco on the left, on it's third element, is now relegated to heating sparge water. In the middle is my last remaining beer sphere, Peco mash tun and demi-johns. Inside the blue sleeping bags there is 10 gallons of beer in the final stages of primary fermentation. I bought my ingredients from Hillgate Brewing Supplies in Stockport, the shop mentioned by Boak and Bailey. It must have been just after the shop had changed hands from Pollard. The man running it was John Hoskins, if my memory serves me right. I would phone in an order: "Two of page 88 please" and pick it up the next day. He would make up recipes from David Line's "Brewing Beers Like Those You Buy", which was a boon for a novice brewer without any scales. That book and it's brother "The Big Book of Brewing" were my guides throughout my initial brewing experiences. I had developed a taste for traditional cask conditioned ales as championed by CAMRA, and was determined to make my own beers like that. With the repeal of the brewing license laws in 1963 by Reginald Maudling home brewing beer became popular. David Line was a pioneer in small scale domestic, kitchen, beer brewing. He developed a lot of techniques and went on to try and recreate recipes like the commercial beers. When we first moved up to Orkney I thought that I should get new copies of these books, as the old ones were getting a bit battered. I bought them on-line which gave me the opportunity to review them, which I did with glowing praise. A few months later I checked the reviews again to see what others had said. There was a comment for TBBoB: "This guy recommends fermenting in a trash can! Eugh, I don't think I'll bother with it!" or words to that effect. A review for BBLTYB said "I've tried brewing three of these beers, and not one of them tastes anything like those you buy." Actually they were quite right. But they had completely missed the point that it was the beers that they bought that had changed over those 22 years and not the recipes. 86 Eldridge Pope : "Royal Oak"
87 Fullers : "London Pride"
91 Greene King : "Abbott Ale"
88 Gales : "HSB" still my favourite. Now I add 1/2lb of flaked oats for the mouth feel. I never did add the saccharine. 94 Hook Norton : "Old Bill"
109 Shepherd Neame : "Best Bitter"
I can still remember Stella Artois changing in the late 1980s, so that I would only buy imported Stella. That made in the UK was just not the same. Come to that when I bought some cans of Guinness five years ago, it was just not right either. To me it is so sad that these traditional beers, lagers and ales have changed their manufacturing methods and now taste nothing like their original forefathers. Fashions change. American citrus hops have become popular, Mango IPA and other exotic recipes, all these leave me cold. I prefer the old traditional British cask conditioned ales, and so I will continue to brew my own. On a completely different tack, I have been wondering why it is that Merryn and I have so much difficulty in explaining the science and biochemistry of malting, mashing and fermentation to archaeologists. David Line was an Electrical Engineer, as was my father. He was one of the engineers involved in building the National Grid after the 2nd world war, and he used to make hedgerow wines at home. I used to be a Computer Systems Engineer and I am from a scientific/engineering background. I wonder how many other brewers have a science background and if there are any with a humanities background. I wonder if C.P. Snow's concept of two divided cultures (Two Cultures) has something to do with this communication gap. Archaeologists, anthropologists and sociologists are all usually from a humanities background. Maybe they see things completely differently from myself and other engineers. When I try to explain a scientific fact to an "ologist" they often tell me it is just an opinion. In the absence of corroborative evidence from their own literature it cannot be considered significant. Whereas to me it is a truth, like gravity and other phenomena. This blog was written by Graham the brewer. Opinions are entirely his own. 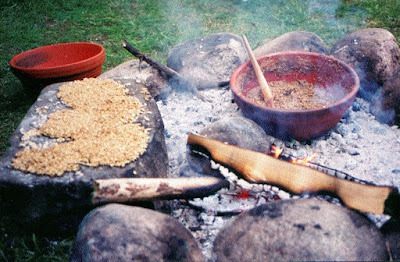 When we first started investigating the origins of beer brewing, I was fortunate enough to have been making beer from the grain in the traditional* way for some 15 years. Brewing on a small scale of 5 to 10 gallons at a time, which would be about the volumes of some of the large Neolithic Grooved Ware buckets that Merryn had found in her research into the literature. So I thought this was quite a relevant experience. The processes for making beer can vary according to climate and equipment, but the fundamental biochemistries are invariant. *) By traditional here I mean the European tradition, as from around the 18th Century, when brewing first became industrialised. The American tradition was interrupted by Prohibition, when malting and mashing was turned into making malt extract for the food industry. Malt extract is a late 19thC invention. It was marketed as a health supplement. When Prohibition was repealed American brewers mostly used extract, because it is a lot easier to make and to control extract brewing; their mashing arts were largely lost. Many American home brewers use extract or "brew in a bag" or a mixture. Americans would call what we do "conventional all grain brewing" see "brew in a bag" explained. I had made enough beer and enough mistakes to have a good idea of what works, and what doesn't. So when I read the Archaeological/Anthropological literature on beer brewing that Merryn had gathered I realised that it was useless. It was largely anecdotal, confused and confusing, for it was written by academics who had never made a beer, and their source material was also from academics who had not made beer, they kept repeating the same old myths. They are considered to be experts in this field, but none of them had ever made a beer. How can one be an expert when one has no experience? A lot of the archaeological literature on beer brewing is completely wrong. There seems to be an unshakeable idea that somehow there was some sort of primitive or primordial beer that had been discovered when a loaf of bread fell into a bucket of water, or grain in a pot was rained upon, and they then spontaneously turned into some sort of beer. It was a primitive beer, but it was steadily refined into the modern product. All three stages require completely different conditions, so there is no way that any two or even all three could be conflated, they have to be separate. So I set out to see if I could make this beer-bread or Bappir that both the Egyptians and the Sumerians had used. I could see that there was no point in baking a yeasted loaf of dough or even malt in a conventional oven, and then expect to make sugars from it. The heat would kill the yeast and any enzymes long before the bread had conventionally baked. Bappir could not be anything like bread as we know it. The naive academic assumption is that anything baked in an oven must be bread, just as there is an assumption that all querns were for grinding grain into flour to make bread. However, I thought that if crushed malt was mixed with water into a very thick mash, and if this was placed in a very low oven, there was a chance that the mash would pass through the band of temperatures necessary for conversion and hopefully stay within that band for long enough to effect a conversion. We had an old 1960s very heavy gas cooker that had been converted from town gas (pyrolised coal) to natural gas (methane). It had an oven with the lowest setting , gas mark 1/4. It was very much like this illustration below. Two metal cup-cake trays were filled with a stiff mash of crushed pale malt and cold water and were put on the bottom of the oven late one evening and left overnight. As we went to bed we were encouraged by the aroma of a mash that was just beginning. In the morning the kitchen was filled with a rich beautiful aroma and the contents of the trays was a deep brown, crispy, crusted and almost dry. I now know that what had happened was that the mashing had at least partially succeeded, and then as the temperature had increased, the Maillard reaction had created the delicious aroma and flavours. The product was baked so hard onto the trays that the only way to remove it was to add hot water. Beer sugars are incredibly sticky and make a powerful glue. Unfortunately there was not enough to make a beer with, but it demonstrated a proof of concept. This was in 1997 and the only digital camera I could borrow was of very low resolution. I didn't take any pictures. Those people who were prepared to taste it thought it was delicious, a bit like granola. This is why there is no substitute for actually doing these things, to get an understanding of what is actually happening. There is so much about the brewing processes that is experiential, the smell, the colour and so many little indicators to give an experienced person feedback as to what is happening and how to regulate it. One really has to do it, to get one's hands sticky, to really appreciate the saccharification. It is one of those clubs that one can only join by doing it. This blog is about trying to recreate this experiment, only this time I would measure, record and take pictures. I have the benefit of much more experience, knowledge and understanding. Enough for me to realise how little I really know, and how much more there is to know. I also have the benefit of Lars Garshol's research into traditional Farmhouse brewing. It is an excellent ethnographic study of North European traditional brewing, often using equipment and techniques dating back to at least the Iron Age, e.g. wooden barrels, buckets and other wooden vessels. One needs iron tools to make staves easily. Here is his blog on Keptinis : Traditional oven mashing. Our new cooker is also gas (bottled propane), but smaller and of a much lighter construction. It would not take two cup-cake trays on one level. It also has a different control for the oven, no 1/4 only a very low S, which I take to mean Standby or pilot. As I wanted to try making a beer with this batch I decided to use one cup-cake tray and two aluminium food trays. I chose a silicone tray in the hope that if the cakes set solid, they would be easier to remove. However as I discovered the sugars will stubbornly stick to anything! I made a stiff mix of water and crushed pale malt at 60C. This was probably a mistake, it should have been 20C. Then I found a shelf that gave a steady 70C, about half-way up the oven for the cup-cake, and put the two deeper trays on next shelf up and left it for two hours. After that I moved them to the top of the oven and turned the heat up slightly and left it for a further two hours. I wasn't prepared to leave it on overnight, because I didn't know how much gas was left in the bottle. There was not much darkening, so it had obviously not got hot enough to cause much of a Maillard reaction. Again a mistake it should have been much hotter. This was transferred to a mash bag, and hot water added to just cover the grains. The mash bag was drained, and hot water again added to cover the grains. A second covering produced a liquor with very little sweetness and was discarded. About six pints were recovered, enough for fermentation. An iodine starch test showed that it was not a complete conversion, but there was enough sugars for a 4 day ferment. Then I added dried meadowsweet flowers as a preservative, too many I think. The finished product, quite light, maybe 3% and far too much meadowsweet, so much so that is no discernable malt flavour, but it is still drinkable and alcoholic. I need to do an awful lot more work on this until I can reliably repeat oven mashing. Yes it is possible to successfully mash in an oven, but it requires a very low temperature, much lower than needed for a Maillard conditioning, which again needs a very much higher temperature. The two are exclusive. So were the Egyptians mashing with their beer bread, or were they conditioning an already converted mash? We may never know, but certainly Heirakonpolis has six large and very fine mash tuns, and also the Egyptian texts describe many different beers, of a variety of colours and darknesses. So on balance I think that beer bread was just a way of conditioning an already converted mash, to give it colour and flavour. We were just very lucky that our old cooker in Manchester had such a thermal inertia that it could spontaneously both mash and condition.